I have stolen princesses back from sleeping barrow kings. I burned down the town of Trebon. I have spent the night with Felurian and left with both my sanity and my life. I was expelled from the University at a younger age than most people are allowed in. I tread paths by moonlight that others fear to speak of during day. I have talked to Gods, loved women and written songs that make the minstrels weep. So begins a tale unequaled in fantasy literature - the story of a hero told in his own voice. It is a tale of sorrow, a tale of survival, a tale of one man's search for meaning in his universe, and how that search, and the indomitable will that drove it, gave birth to a legend. Where to begin? A lot of my usual recommenders have urged me to get into this series, and I’m so glad I finally decided to pick it up. I loved this book. I wasn’t so sure for the first hundred pages or so, but once I was into it, it was hard to surface. Kvothe tells his own story in an easy, witty style, and I found myself laughing out loud a few times. Its hard to describe why I enjoyed the reading of this book so much, only that its 700-odd pages flew by remarkably quickly. 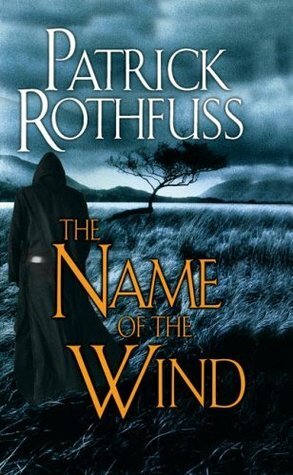 This book is less of a epic fantasy tale and more of a series of episodes that tell the story of Kvothe’s early life. This does tend to slow the story down, especially in the early stages, but I never felt the flow of the story was disturbed too much. Looking around at other reviews, people seem to either adore this book or hate it with a passion. The storm seems to mostly revolve around Kvothe, and whether people can stand how perfect he is at everything. Without mentioning terms like “Mary Sue” or “wish-fulfillment” (I hate those sorts of reviews), I do have to admit that I found Kvothe a little too awesome at times. Everything just came naturally to him, and he used that to his full advantage on more than one occasion. I had to remind myself that this is supposed to be a story that he’s telling about himself, so he’s allowed a little poetic licence from time to time. Still, I found it a little off-putting that he was accepted into and able to rise through the ranks at the university so quickly. I prefer my heroes to work hard or suffer for their gifts. Denna struck me as a sort of Jenny character, you know, from Forrest Gump – a troubled soul, blown around by the wind, who happens to fall in with one of the good guys who adores her but is too shy to do anything about it. She kind of annoyed me as well, but I enjoyed their time together. It’s just those few characterisation issues that have dropped half a star for me. I couldn’t drop it any further because I just enjoyed reading this book so much! I hear the series has been optioned for TV. If they can pull off the grand scope of the cities, the university, the draccus, the Eolian theatre, etc, it should be awesome. I hope it gets some epic Game-of-Thrones-style funding to put on a great adaptation! – Recommended for fantasy fans of all types. A grand hero story, told in an engaging and not-so-grand way. I’m hoping to get stuck into The Wise Man’s Fear very soon! Not sure I have any hope for the TV series. But I do have a soft spot for this book. I read fantasy occasionally. It’s good that after you got all those recommendations you tried it out. I like my heroes to have to work hard too! I’m so glad you liked the book! I so hope the TV show actually happens and if they pull it of well it will be so EPIC! Rochelle Sharpe recently posted…Writing Quote Wednesday. I’m great you enjoyed a book that you have been recommended, I’ve heard this author before but hadn’t read any reviews about his stuff. It does sound pretty epic though! I think I’d be a lover of this book.